I was reading your post about Toys, Tools, and Curriculum That Have Held Up in Our Homeschool and I would like to ask you if you have any preference for the 1st grade to 3rd grade curriculum? I know you mentioned Rod and Staff for preschool or kinder but what did you or will use for your little ones after that? I will happily tell you what we have done or are doing for 1st-3rd grades, but it might be helpful if you have some sort of a goal in mind. Why are you homeschooling your child? What are you using as your guide? Are you following your state's Scope and Sequence, using a "canned" curriculum like K12, or following a theory such as the Classical Method or a Charlotte Mason approach? There is no one right way for everyone, but it would be extremely helpful to have a goal and a plan. With that in mind, you should know that we have used a Classical approach with a whole lot of eclecticism thrown in for good measure. One size does not fit all, and the ability to use a variety of approaches suited to our various students is one of the reasons we continue to homeschool. Math-Rod and Staff Grade One. From my Marvelous Monday post: "We really, really like Rod and Staff math in the elementary years. For one thing, the books are rigorous and very straightforward. I have a personal aversion to curriculum designed to look "cool", and these Mennonite published books are- how shall I put it?- decidedly not cool. Rod and Staff is also very thorough in scope. Measurement, money, life skills, math facts, and all elementary level math skills are covered and covered and covered again. Lastly, and this may sound pathetically trite, Rod and Staff is extremely affordable. In fact, even when the books become hard-cover texts beginning in 4th grade, we just let the kids write right in them. The price of the hard-cover books is less than most math curricula's consumable texts." Reading/Phonics-TATRAS and Rod and Staff Phonics Grade One. We use TATRAS to learn to read, which typically begins to happen in kindergarten. Once we've completed TATRAS (whenever that might be for each student- some have been well into 1st grade), we move on to the solid phonics study of Rod and Staff. Some of it might be overlapping TATRAS and if that's the case, we just do the letters and/or phongrams we've already covered in TATRAS. Handwriting- We have used many different things over the years, but I'm mostly camped on Handwriting Without Tears. It seems to be the most straight-forward, unintimidating handwriting series for us. Plus, we all now sing the little ditty, "Where do you start your letters? At the top!" Handwriting Without Tears is straight-forward and laid out in a manner that is extremely homeschool-mom-friendly. 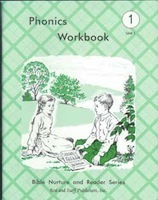 The consumable workbooks can be handed right to the child and with a sentence or two of instruction, they are on their way. History and Science (nature study, really) are done as a group. Be sure to click through the links and read about our favorite elementary history and science curricula. What else? Beyond the basics, you have an unlimited array of choices: music, art, Latin (yes, Latin. My girls thought this was so fun! ), sports, dance, Bible, etc. I need some other homeschooling mom's advice. I'm hoping lots of mothers will comment here, in my mess of a mind dump. I asked a question a while ago about having kinesthetic learners and you mentioned you have 2. You also mentioned you don't make curriculum adjustments, but let them do math on the trampoline, etc. My oldest is seven and is a TOTAL kinesthetic learner. It's cold here in Tennessee and we have been cooped up in the house for days (going on weeks) on end. We use Rod & Staff, which my husband and I love, but is not geared at ALL for her learning style. In second grade we (oh, and I mean "we" because this affects me as well! lol) have approx 11 written worksheets daily -- complete worksheets to be written, as well as all the reading that goes along with it. She's incredibly bright & knows the answers most of the time, it's just the actual getting them on the paper in such mass quantities that seems daunting to her. I'm doing all I know to do for such a learner (breaks, Leslie Sansone walking dvd's, etc.) but she's still worn out. And so am I. Is this normal for 2nd grade, this level of rote activity? I'm wanting to switch curriculum for next year, but my husband doesn't. I'm happy to submit, but I still need to meet her where she's at. He feels as if college isn't going to cater to her so why should we. I feel as if I have 11 years to help her be prepared for a college setting. She's come a really long way but this is still taking a lot of discipline for a seven-year-old. Should I base my schedule off of the needer-of-all-the-breaks or the busy almost-two-year-old? Then fill in the gaps with the other two homeschoolers (pre-k & 1st grade)? Any other moms with Kinesthetic learners who have some advice as to what worked for you? We're starting to have more & more days of struggle & I want to fix this before it gets worse. Barbara, yes I have had two highly active students so far. The first is my now-21-year-old, who still needs a lot of physical activity in his day and who paces the house restlessly when he doesn't get it (his fiancee's parents have even mentioned this to me - ha!). He has learned to do his studying in shorter spurts, and he has kept his physical needs in mind as he's chosen what to study in college. He lives in Phoenix now and last semester he carried a full college course load while working as an RA (resident assistant) and 30 hours as a manager of several resort lifeguard teams. He did raise the white flag this month and quit that last job. Still, he'll be the guy who runs a mile on his lunch break. The other is my 12-year-old daughter, who is an 8th grader. She is a quick learner, but having to do two pages of her math book makes her crazy. Makes me crazy, too, because it means she's up and down in her chair, in and out of the room, talking to her sister, listening to ambient noises, and singing Christmas carols, usually all at once. When she was younger, we devised a little system for her, wherein she completed a page and then ran to the top of the stairs. Sometimes, we still have to do something after every problem. But sometimes, we just have to look for other approaches. Instead of pages of math, we would pull out the math facts puzzle, or a math game, or even a math video. How about cooking as math, or shopping as math, or a nature walk that encompasses some math? Sometimes I think we feel bound by the curriculum we purchase, but we always have to remember to use it and not the other way around. If worksheets are burrying you, then by all means give yourself permission to take a different approach, if only interspersed between the worksheets. More favorite board games here. In the ten years that Preschoolers and Peace has been online, I've reviewed many resources and written plenty of posts about curriculum and other tools for learning and raising children. Draw Write Now The Draw Write Now series is indispensable. Our kids have pulled these books off the shelf for years, learning to draw everything from farm animals to the Statue of Liberty. Even if you can only purchase one book at a time, you won't regret the investment for kids who like to draw and fill their free time with something valuable. Each subject includes copywork, too, if you're wanting a little older student to practice their handwriting. Currently, our five-year-old up to our 7th grader use these. Creativity Express I really don't have enough good to say about the Creativity Express product. We have owned this one for a number of years, and my kids are captivated by it. You know an educational product is worth the time and money when a child later references something they learned with it, and that happens regularly with Creativity Express. I reviewed it in its CD format four years ago, but Creativity Express is now entirely online. From my original review, " I learned so much just sitting by the kids as they explored its many levels with all kinds of art history facts, artist profiles, masterpieces, and even hands-on projects that allow the student to explore concepts of color, spacial relationships, and other art concepts that are a bit beyond me to pull off. The animation is excellent, done by former Disney animators." Wikki Stix For those of you who are like me and without a creative bone in your body, Wikki Stix are the answer! Great for quiet play, church, the doctor's office, or for writing notes to dad on the front door. I buy new ones every year, and when they've lost their stickiness, everyone must wait for next year. Oh, the anticipation! Legos A no-brainer, right? We've got a bajillion Legos in our home, and while they took about a two-year hiatus between the older boys and the little boys, they are back in daily play. I don't think there will ever be a time when we don't own Legos in our home, because they really do cross gender lines and abilities. A great investment for our children and grandchildren. 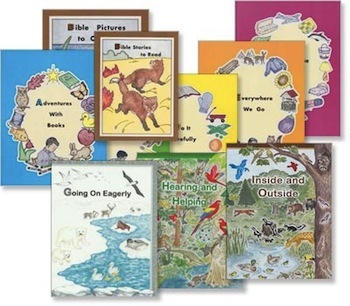 Rod and Staff Preschool Every one of our older preschoolers have worked through this series of affordable, thorough workbooks. They have a nice variety of activities, from printing to early logic problems to phonics to coloring to cutting and pasting. By the end of the series, our kids are ready for first grade work. Called preschool workbooks, they really are meant to be for kindergarteners, or kids around five years of age. If you're looking for school supplies, check out this post I wrote about the pencils, pencil sharpener, scissors, glue sticks, colored pencils, and page protectors that have stood up to 19 years of homeschool abuse. What toys and tools have stood the test of time in your home? Back in 2008, faithful readers of Preschoolers and Peace followed along in real time as our 8th child, Joe, was whisked away to a nearby children's hospital after I found him in a coma. Two weeks later "Mighty Joe" emerged with the effects of heart damage, kidney failure, liver failure, and permanent brain damage. Six months later, I then accidentally ran over our 5-year-old with our 12-passenger van. That horrifying incident led to an investigation by Child Protective Services, but our tiny 5-year-old lived with a simple fractured pelvis. Our foundations were not so simply fractured, however. A year later we woke one morning to discover our 8-year-old daughter in septic shock. She had a ruptured appendix that nearly took her life and kept us in the hospital for another three weeks and three surgeries. We would soon find ourselves losing our grip on everything we thought we were doing right (including this blog). Now New Growth Press is publishing our story. Lost and Found: Losing Religion, Finding Grace is the gripping true story of how God used suffering to save our family from empty religion. As wave after wave of crisis hit, we discovered that getting religion “right” wasn’t a good substitute for a living relationship with a loving God. Through our suffering, we learned about misplaced identities and false hope, and we threw ourselves wholly into the arms of Jesus—where we found the grace we so desperately needed. Will you help me to spread the word? I am thankful that God has given me the opportunity to tell our story again and again, in the hope that others will find their own freedom in the gospel, too. You may recognize that this is a story for you — a call to remember your identity in Christ. Or you may know someone who is in serious need of a fresh reminder to find their purpose, worth, value, and significance in Jesus. Lost and Found: Losing Religion, Finding Grace will be released in February of 2017, and we can't wait! But one of the best ways to spread the word is to pre-order your own copy because booksellers see those pre-orders as an indication as to whether or not they should carry the book in their store or website. It would help immensely! For reading, for praying, for commenting, for encouraging. Our stories are intertwined, and I am so thankful. My teenage girls and I took a Saturday last week to fill the freezer with food so that the first few weeks of school wouldn't completely sack us. I posted a pic on Instagram and several of you asked me to share our plan and recipes. Yes, of course! Why reinvent the wheel? We homeschooling moms (we non-homeschooling moms, too!) need each other. Rolling Meatballs - This amount filled two sheet pans. Time: This plan took us 6 hours, including cleaning the kitchen afterwards. Amounts: Each meal we made will feed 8 of us - 3 adults, 3 teens, 9-year-old and 8-year-old boys. We did double the amounts for the chicken meals, but I did not reflect that in the included shopping lists so that you can make the adjustments you need. The Workload Breakdown: The 17-year-old made two pans of cinnamon rolls and washed dishes for us before she had to go to work. The 15-year-old made the smoothie packs, bacon for the breakfast burritos, waffles, and took pictures. The 12-year-old made the corn dog muffins, chopped veggies, grated cheese, and washed dishes. I gave them each a choice of what they would like to do and I did the remainder of the cooking and prep. The 9-year-old boy was so disappointed that we were nearly done by the time he came inside that I gave him the job of shooting the little video on how to roll the burritos. Tip: Keep your expectations of your helpers at a realistic level. Mine can't handle the amount of work I plan to give us all so I know they'll fizzle out sooner than I will, and that's okay. Put chicken ingredients in freezer bags and freeze flat. Gluten Free? Use this list. The non-gluten free list is below. note: This list does not include ingredients for cinnamon rolls because, sadly, we haven't found a gluten free cinnamon roll recipe we like. 10 1/2 lbs ground beef - we use Zaycon. Feel free to ask me any questions you have about ordering from Zaycon. We love it! Alton's Brown's Waffles of Insane Greatness - when substituting gluten free or regular baking mix, just add 1 cup of the mix and omit the dry ingredients except the sugar. Corn Dog Muffins - we use the muffin recipe from the How Can It Be Gluten Free? II cookbook, but all you need to do is find a corn muffin recipe you like, cut a piece of hot dog, and sink it into the batter before baking. Mighty Joe loves these in his lunch with a little container of ketchup. Bake 1 lb of bacon in a 500 oven. Cool and chop. Grate 1 lb of cheddar cheese. Scramble 44 eggs in 2 sticks of melted butter. Huzzah! Add the bacon pieces and the grated cheese and stir to mix well. Roll into burritos. To see how to get it done quickly, watch video below. Freeze yogurt into ice cube trays. Add frozen yogurt cubes and fruit to quart-sized freezer bags in amounts that look right to you. How's that for exact? When my kids use these for smoothies, they add a milk of their choice and whip it all up. Cinnamon Rolls - The only cinnamon rolls we make around here! Meatballs - I make a few adjustments. You can, too, to suit your liking. I use milk instead of water and all ground beef because that's what I normally have on hand. I make bread crumbs out of the fresh white bread. Someone has to wash all those dishes . . . Happy back-to-schooling, however that goes down at your house! With a freezer full of ready-to-go meals, I'm hoping it's smoother sailing for you and yours.